In this post, SKOTechlearn will describe the step by step process for developers, who want to develop an application which can Search all files from folders or directories through string in vb.net. We can list all files which contain that string which we use for find files from existing folder or directories or from all folders and subfolders. So here, we will proceed with following process. Which types of controls, we need for it? For simple understanding purpose, we drag a TextBox, ListBox and a Command Button. Through these controls, we proceed for further process. Let’s start with simple learning tips with SKOTechlearn. 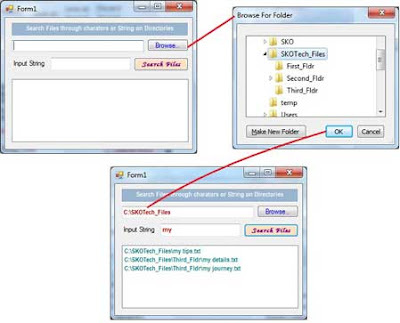 Suppose you want to find those files which contains particular character or String. And want to describe a fix path with folders and subfolders. But first, take a look of controls adjustment for finding and listing. After complete coding, run the application. Input searching value inside “Searching_Txt” textbox. And press “Search Files” button. You will find you searching value’s containing files will show in “ListBox2” like following. In this process, we have to need another input box like Textbox for browse path dynamic process. So first we have to write code for Folder browse path. First Go to Toolbox and find “FolderBrowserDialog” control. Second drag this control to Form. Then write code inside “Browse..” button which you add for browse directory like following. Just copy this code and paste it on your application’s control. Note: If you do not change control’s ID according to given description, then change controls id Name from this code same as you mention on your Form. Now, run application, and search whatever your files you want to find from particular directory or directories. 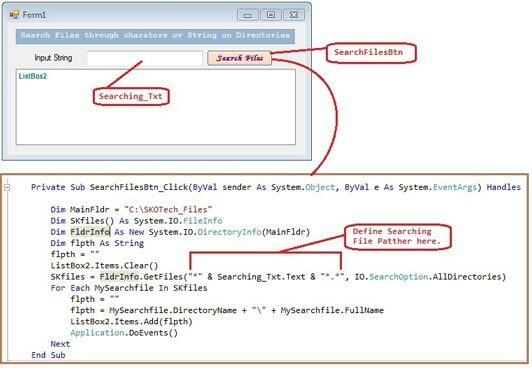 So, there is the way to Search files from folders or directories through string in vb.net by SKOTechLearn Tips.